Since 1990, we have provided integrated consulting services that include management consulting, strategic planning, program design and implementation, policy and regulation development, facilitation and related decision support services. We utilize a collaborative framework to foster participation. 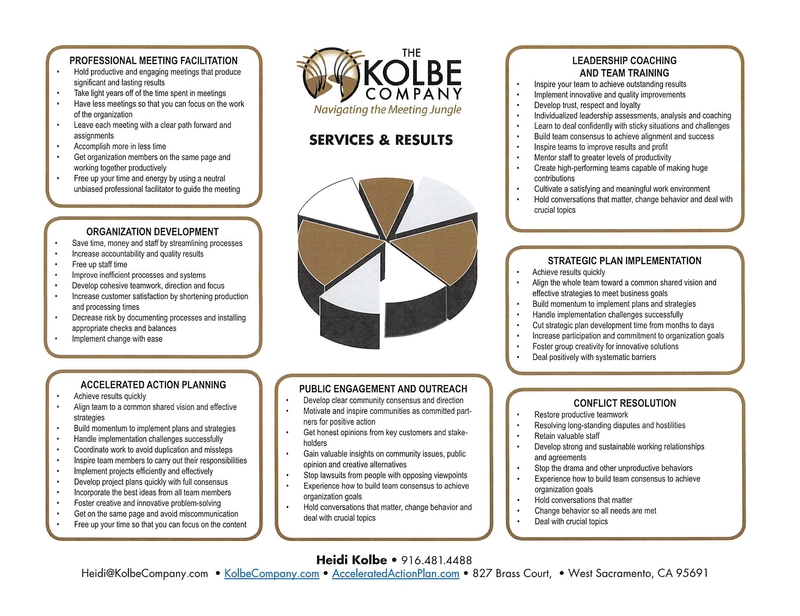 We use a wide variety of tools and processes for organizational assessment, consensus decision making, team-building and coalition development. Our meeting and conference design methodologies ensure decisions and results in less time than traditional facilitation techniques and produce tangible results, including team motivation and action. By intentionally honoring the diversity of perspectives, this approach successfully integrates the contributions of all involved. ToP® facilitators can bring disparate opinions to consensus quickly and respectfully. Since there is broad and active participation, groups can deal with far more data in less time than in traditional meetings. High levels of participation in the decision-making process generates commitment that increases follow-through and accountability. This approach moves people from superﬁcial buy-in to ownership of decisions, strategies, and plans. The breadth and depth of involvement in these processes insures a longer-term investment in the organization and interest in learning and continuous improvement. These customizable methods have been used in thousands of situations with various sized groups across the globe to share information, solve problems, make decisions and plan for action.